Close to midnight on the first June 9th celebrations, neighborhood residents gathered to witness the removal of the holy relic. Around the stone, residents had hung a canopy decorated with lights, flowers and evergreens. 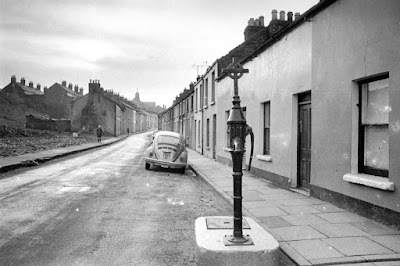 Tiny crosses surrounded it, and when the canopy was illuminated, “it seemed indeed a votive altar to Catholicity and Saint Columba in the public streets of Derry.” For several days beforehand, men of the community had kept vigil, never allowing the tiny lights surrounding the canopy to extinguish. Now that the midnight hour has sounded, thirteen hundred years ago, at this hour, that night, Columba lay dying on the altar steps of Iona. ‘Raise my hand,’ he feebly cried, ‘that I may bless you all; higher still that I may bless my beloved Oak Grove and those that dwell therein.’ Let us now, before we part, turn to the altar and ask Our Lord to let Columba repeat that same blessing tonight. May every anniversary feast of his be kept in this church as today’s has been. Within the last few days there have been many evidences of the vitality of Catholicity and unaffected piety in Derry, and in the religious services which were attended so numerously and participated in so fervently there was an admirable exposition of practical faith. The Sentinel was not impressed by the observations of the thirteenth centennial and incensed by the stone removal. In an article, the paper opined that Catholic Derry had imbued the saint with “character and attributes to which it is doubtful he would have wished to lay claim.” The removal of the kneeling stone was seen a “lawless plot” even though it was connected with “ridiculous superstitions and nonsensical survivals” like believing that blessed water had curative properties. The notion that a piece of public property could be “smuggled away without a whisper of warning” did not auger well for the city. At any rate, the paper took exception to a Catholic public gathering where “audible prayer and physical force were blended” in the wee small hours. And thus, in its protests, a hint of anxiety emerged about the combination of Catholicity and strength. In the years following 1897, the celebrations of Columba grew. Local people took more responsibility for the event and its religious observance became integrated into the city’s Catholic calendar. The following year, local reporter William O’Kane observed that the event was, “more earnest and intense than even last year’s.” Chroniclers of the event were struck by local involvement, and by the seriousness with which Derry people had participated. The Journal made special mention of “the poorer people,” calling the events of 1898 a tribute to their devotion. By 1898, quite separate from Father Willie’s supervision, local Catholics initiated a tradition of building and erecting tall arches that towered over the small terraced houses of the Bogside to mark their saint’s holy day. (Figure) Echoing the triumphal arches within the walls that commemorated the Siege of Derry, these gateways that spanned roads all over the neighborhood rose out of the streets of Catholic Derry. Made with flowers, paper, cloth, papier-mâché and cuttings from trees and bushes, the arches’ designs centered around shamrocks, quotations and images of saints and angels. Flags and crosses hung from their corners, imitating the impressive gates into the walled city upon the hill. People painted oak leaves on their windows. The invented traditions surrounding Columban celebrations did not replace politics but they did bring religious and cultural identity together in real ways. In the same year, Derry sent groups to Dublin to take part in the ’98 centenary observances of the United Irishmen’s Uprising. Derry men walked under the banner of Wolfe Tone, who was captured in Buncrana, famous for calling the union of Great Britain and Ireland “the scourge of the Irish nation.” In the early years of the twentieth century, the Éire Og (Young Ireland) movement was formed in Derry by Bishop O’Doherty, P.S. O’Flannagain, Eamon MacDermott and others. The organization was a classic Gaelic Revival stronghold and its members, 400 strong, played Irish hurling matches, hosted ceilis, learned the Irish language and practiced military drills.